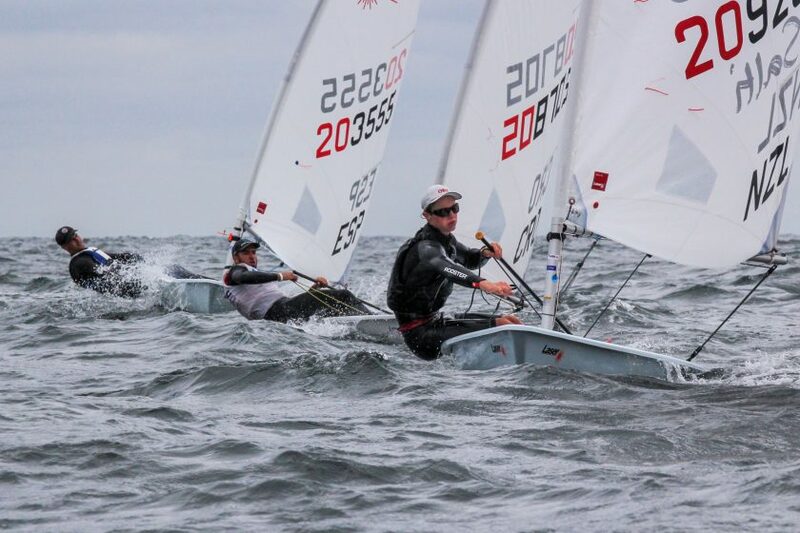 (Kiel, Germany) With waves and 15 – 17 knots of breeze, the dinghies danced on the water through the first races of the Laser Radial Youth World Championships in Kiel Schilksee. They launched into the downwind with quite some speed. Those who had to give way to others were fighting not to capsize. Laura Schewe (GER), Josh Armit (NZL), and Ludvig Lindqvist (SWE) handled the conditions the best. While Emma Savlon from the Netherlands could keep Laura Schewe at bay in the first race of the day, she was disqualified in the second race and thus was in 47th overall after the first day. Laura Schewe, however, did not make any mistakes and improved her results in the second race, won the race, and is now leading the fleet in the overall ranking. “It could have not been much better. The conditions were really nice. The waves were challenging,” said the sailor from Kiel about the day. According to Schewe, it is new to her to start the next day as the leading sailor in the fleet, but she wanted to concentrate on the fact that the next day is a new day with two new races and different conditions. 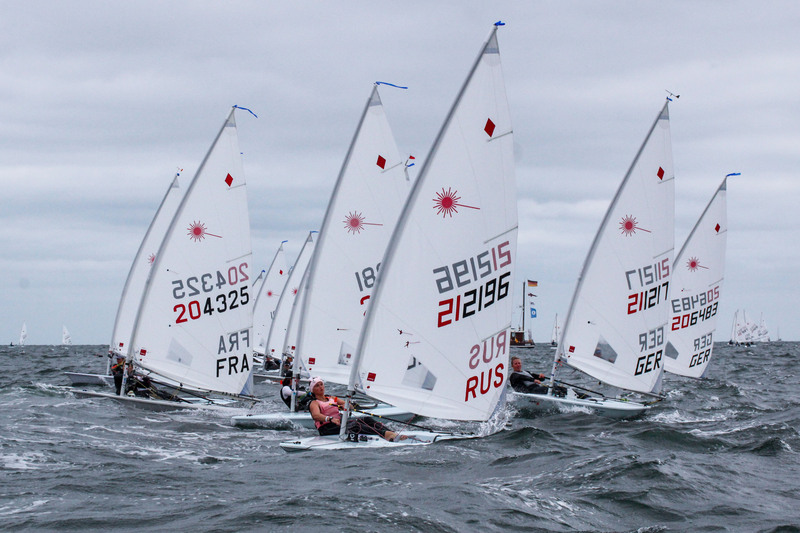 101 sailors from 30 nations sailing in Kiel for the World Championship title. Here, French Alix Devineau and Russian Valeriya Lomatschenko lead off the start. “I had a good first race,” explained Emma Savlon, second at the World Sailing Youth Worlds in Corpus Christi. While she also had a good start in the second race, she chose the wrong side on the second upwind and thus lost some places. On top of that, she was disqualified and slipped down to 47th overall. For the two races tomorrow, she is aiming for constant races and finishes in the top three. She’s determined the conditions in Kiel are more difficult than in Texas a few weeks ago. Russian sailor Valeriya Lomatchenko is currently in second overall, while Ana Moncardo Sanchez from Spain is in third. Fourth overall is Julia Buesselberg, who sailed two fourth-place finishes. Josh Armit, who recently won the World Sailing Youth Worlds in Corpus Christi, was not really satisfied. He was happy about the stronger winds and travelled to Kiel to learn and give his best. “If I feel well in the regatta, I know that I am sailing well.” Today he made some mistakes, he admitted. But this was leaving room for improvement for the next day according to the young sailor from New Zealand. But the result was nevertheless quite good. After a first and third place in the two qualification races of the day, Armit is leading the fleet after the first day. “It was quite a bit warmer than during Kiel Week,” he said about the day on the water. Armit is sharing the leader’s position with Ludvig Lindqvist from Sweden, who also finished with a first and a third. Julian Hoffmann is right behind them. After finishing fourth in the first race, he won the second race.